Many confidently proclaim that they follow the teachings of Jesus Christ. But can the vast array of religious beliefs really all be based on what the Bible teaches? Millions of people say that they are “Christians” and are part of the belief system of the Christian religion. But do some claim the name of Christ, then follow beliefs and practices that are the antithesis of what Christ taught? Does Jesus Christ have many different church denominations, each teaching a different set of beliefs and practicing different doctrines? Has Christianity departed from the original teachings of the Church Christ established? The truth may cause you to challenge your present Christian views and beliefs. Question 1: Is there one Church or many denominations? Jesus Christ did not come to establish many different denominations. Instead He stated, “On this rock [Christ Himself] I will build My church, and the gates of Hades [the grave] shall not prevail against it” (Matthew 16:18). The true Church He founded would never cease to exist. Jesus backed up this announcement with the promise that He would continually support and sustain His Church: “And lo, I am with you always, even to the end of the age” (Matthew 28:20). This Church will teach the same things Jesus commanded, preach the same gospel message He preached and contend earnestly for the same faith He delivered to the saints (Matthew 28:20; 24:14; Jude 1:3). This Church, called the Church of God throughout the New Testament, will practice the original Christianity. It does not have multiple denominations or multiple sets of beliefs. Where is the Church that Christ founded, with the promise that He would be its leader, guiding and leading His Church throughout all ages (Ephesians 1:22-23; 2:20)? According to the Word of God, His Church surely exists today! And Christ is the Head of His Church. Question 2: What does the Bible say about the size of the true Church? Have those faithful to God ever been many in numbers? Jesus prophesied, “Because narrow is the gate and difficult is the way which leads to life, and there are few who find it” (Matthew 7:14, emphasis added throughout). At no time did the true Church consist of large numbers of people—only a few would find the way of truth. “Do not fear, little flock, for it is your Father’s good pleasure to give you the kingdom” (Luke 12:32). Even at the end of Christ’s 3½-year ministry, the number of disciples was small (Acts 1:15). But the “little flock” has continued to survive until this present time—just as Christ promised it would! Question 3: But aren’t there many sincere Christians? Many who claim to be Christian are sincere and well-meaning, but sincerity by itself does not assure understanding of biblical truths. You can be sincere in your desire to do what is right, but be sincerely wrong. The apostle Paul was sure that he was doing the right thing when he persecuted true believers. He stated, “For you have heard of my former conduct in Judaism, how I persecuted the church of God beyond measure and tried to destroy it” (Galatians 1:13). “I did it ignorantly in unbelief” (1 Timothy 1:13). Paul was zealous and sincere in persecuting true Christians, but he was sincerely wrong. Is it possible that we could be sincere in our religious beliefs and practices, yet also be wrong? Question 4: How can we know if our faith is biblical? Are we willing and sincere enough to follow Paul’s instructions and examine our beliefs in order to see if they are in harmony with the Bible? The New Testament states that “perilous times” will exist in “the last days,” when people will appear to be religious, but lack a proper fear of God, “having a form of godliness but denying its power. And from such people turn away!” (2 Timothy 3:1, 5). The New Testament states that “perilous times” will exist in “the last days,” when people will appear to be religious, but lack a proper fear of God, “having a form of godliness but denying its power. And from such people turn away!” (2 Timothy 3:1, 5). Is it then strange that Christ will say to some who may have thought they were true Christians: “Not everyone who says to Me, ‘Lord, Lord,’ shall enter the kingdom of heaven, but he who does the will of My Father in heaven. Many will say to Me in that day, ‘Lord, Lord, have we not prophesied in Your name, cast out demons in Your name, and done many wonders in Your name?’ And then I will declare to them, ‘I never knew you; depart from Me, you who practice lawlessness!’” (Matthew 7:21-23). Once we have proved that our beliefs are biblically based, then we are admonished to “test [prove] all things; hold fast what is good” (1 Thessalonians 5:21). Question 5: What does the Bible say about religious deception? Is it possible that most people who profess Christian beliefs are blindly following false religious ideas and doctrines? Christ warned: “For many will come in My name, saying, ‘I am the Christ,’ and will deceive many” (Matthew 24:5). Notice this verse does not say the few will be deceived, but the many. The Bible states that Satan the devil is the perpetrator of this great worldwide deception. It is important to understand that Satan is a great deceiver and a liar and, as Christ stated, “the father of it [lies]” (John 8:44). “So the great dragon was cast out, that serpent of old, called the Devil and Satan, who deceives the whole world” (Revelation 12:9). No area of the world is immune from his deceptions. No individual is immune from his power and subtle influences. The apostle Paul spoke about those “whose minds the god of this age [Satan] has blinded, who do not believe, lest the light of the gospel of the glory of Christ, who is the image of God, should shine on them” (2 Corinthians 4:4). The invisible Satan blinds the minds of people so that they do not understand or accept the gospel message of Christ. In fact, they accept a false, contrary gospel that is not biblically based. Millions sincerely believe they are following Christ, but instead have been duped by a counterfeit Christianity. The Bible says that Satan has “his ministers” who “transform themselves into ministers of righteousness, whose end will be according to their works” (2 Corinthians 11:15). These false ministers preach “another Jesus” and have a “different spirit” and teach “a different gospel” (verse 4). It is shocking to realize that there is a false form of Christianity that people have been tricked into following! Satan rules over all the kingdoms of this world. Tempting Christ, he said, “All these things I will give You if You will fall down and worship me” (Matthew 4:9). Satan claimed that all the nations of the world belong to him. Christ also confirmed that Satan has a kingdom (Matthew 12:26). Satan’s rule over the nations will finally come to an end when Christ returns to take over his kingdoms, and then install His own eternal government over all nations (Revelation 11:15). Everlasting peace and harmony between nations will finally be established under the governing authority of Jesus Christ! Question 6: What is the Bible definition of a Christian? 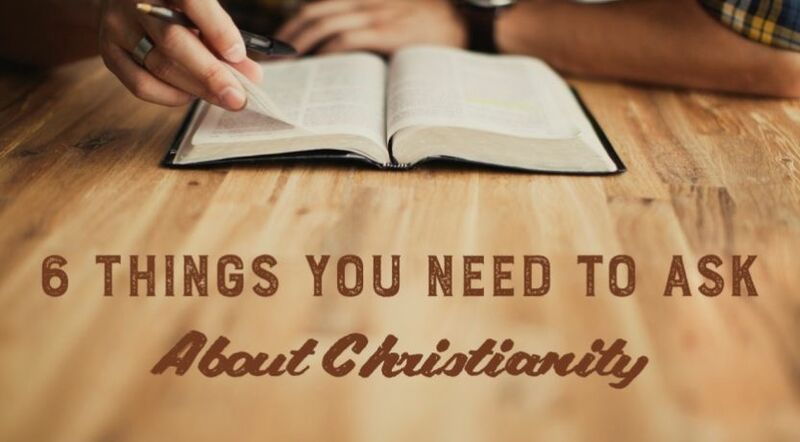 What is a real Christian, and how would you recognize him or her? Christ stated that it is possible to worship Him, but to do it in vain: “This people honors Me with their lips, but their heart is far from Me. And in vain they worship Me, teaching as doctrines [beliefs] the commandments of men” (Mark 7:6-7). To love Christ is to keep His commandments, and not to reject them as many do: “You are My friends if you do whatever I command you” (John 15:14). Paul wrote that the natural human mind is at “enmity against God; for it is not subject to the law of God, nor indeed can be. So then, those who are in the flesh cannot please God” (Romans 8:7-8). Clearly something has to change if we have a heartfelt desire to please God. Fortunately, there is good news. The Bible reveals what changes must occur in our lives for Christ to live His life in us (Galatians 2:20). So if we do not have God’s Spirit, we do not belong to Him—we are not true Christians! But how then do we receive the Spirit of God so that we can belong to Him? Repent—to come to understand that our ways and conduct displease God and then begin to change our way of life, genuinely and from the heart. We need to do our utmost to stop sinning, which is transgressing the laws of God (1 John 3:4). Be baptized. The Bible teaches that this is to be done by total immersion in water. Then receive the gift of the Holy Spirit through the laying on of a minister’s hands (Acts 8:17; 19:6). Please download and study our free booklet Change Your Life! which outlines the biblical steps in the conversion process. The true Church is comprised of individuals who are described at the end of this present age as those “who keep the commandments of God and have the testimony of Jesus Christ” (Revelation 12:17). Jesus promised that He would be with His Church until the end of time, and that He would continue to build His Church. God’s Church is comprised of those who have committed their lives to Christ by keeping “His commandments” and doing “those things that are pleasing in His sight” (1 John 3:22). The choice is ours to make. Either we show our willingness to submit to the will of God, or we can decide to go our own way. God, as a loving Father, urges us to choose His way of life because of its clearly superior benefits. Yet God never forces His will upon us. He leaves that choice up to each one of us. Will you choose authentic Christianity or a counterfeit?